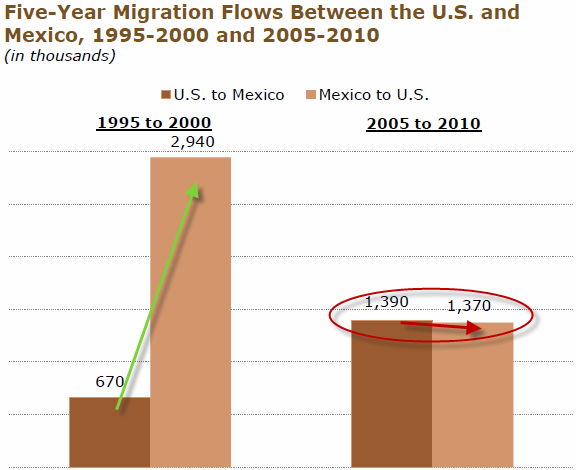 You know its bad when…the net flow of Mexicans into the US has fallen so much that there is a high probability that it is now in reverse ending around forty years of inward migration. The Pew Hispanic Center notes that the standstill – after more than 12 million current immigrants have entered the US – more than half of whom are illegal – appears to be the result of many factors including a weakened US job and construction market, tougher border enforcement, a rise in deportations, growing dangers associated with border crossing, a long-term decline in Mexico’s birth rate, and changing (read perhaps more opportunistic) economic conditions in Mexico (especially if you work at WalMex). This sharp downward trend in net migration has led to the first significant decrease in at least two decades in the number of unauthorized Mexican immigrants living in the U.S. – to 6.1 million in 2011, down from a peak of nearly 7 million in 2007. In the five years from 2005 to 2010, about 1.4m Mexicans immigrated to the US – exactly the same number of Mexican immigrants and their US-born children who quit the US and moved back or were deported to Mexico. By contrast, in the previous five years to 2000 some 3m Mexicans came to the US and fewer than 700,000 left it. It will be interesting to see the spin that the Obama and Romney camps put on this hot-button topic as the ‘Dream Act’ turns into a nightmare and hardline anti-illegal immigration stances become, well, less relevant as Mexicans become Mexican’ts. Mexicans now comprise about 58% of the unauthorized immigrants living in the United States. They also account for 30% of all U.S. immigrants. The next largest country of origin for U.S. immigrants, China, accounts for just 5% of the nation’s stock of nearly 40 million immigrants. Apprehensions of Mexicans trying to cross the border illegally have plummeted by more than 70% in recent years, from more than 1 million in 2005 to 286,000 in 2011—a likely indication that fewer unauthorized immigrants are trying to cross. This decline has occurred at a time when funding in the U.S. for border enforcement—including more agents and more fencing—has risen sharply. Although most unauthorized Mexican immigrants sent home by U.S. authorities say they plan to try to return, a growing share say they will not try to come back to the U.S. According to a survey by Mexican authorities of repatriated immigrants, 20% of labor migrants in 2010 said they would not return, compared with just 7% in 2005.